According to my people, Great Bear in the Sky controls the seasons. Brilliant in the night, he lumbers to his left around the North Star. We stamp our circle dances in the same direction to keep the seasons in their proper order. 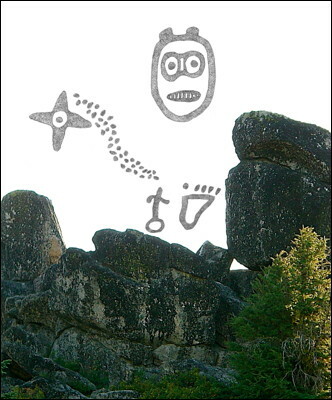 Thousands of years ago, we carved symbols into rock: the foot of a human and the foot of a bear, each on one side of a counter-clockwise spiral. The message reads: Stamping dances to our left keeps Bear dancing the same way. Wild days and nights passed filled with snippets of stormy dreams. When Boy-Almost-a-Man awoke, his mind seemed different. He felt grown up. His name didn't fit him any more. He listened and heard the spring songs of birds in the forest outside, and somewhere down the burrow, he heard snorting and squealing. He squinted and saw two bear cubs playing, one tumbling over the other. He turned over and saw the shape of a large she bear sleeping beside him. He tried to think this through but nothing made sense except the urge to go outside and find something to eat. "I will call myself No-Longer-a-Boy," he whispered. The she bear and the cubs followed him out of their den and into the bright sunlight of a spring morning. They'd been on the trail all morning when they came to the woods where Bear lived. Bear was sitting outside his house on a log singing his waking up song: hae-ya, hae-ya, hae-ya.... He'd been dozing all winter.